Multi Commodity Exchange of India Ltd (MCX), India’s No. 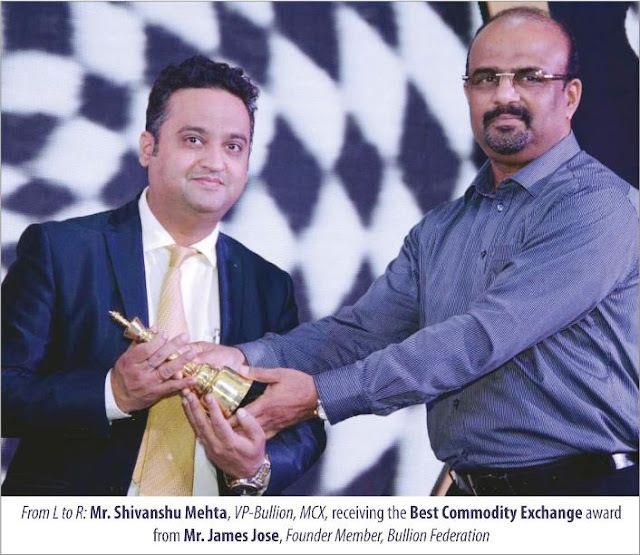 1 commodity exchange, has been honoured with the Best Commodity Exchange Award at the Bullion Federation Global Convention organized by the Bullion Federation in Agra during 21st-24th July 2016. The Bullion Federation is a national level apex body representing the bullion industry to further the cause of bullion trade and its members. The conference was attended by over 400 delegates, including refiners, bullion importers, bullion dealers, banks, foreign banks, logistics companies, commodity exchanges, and media and metal research houses among others. The award recognizes MCX’s commitment towards developing a vibrant commodity futures market in India by providing a robust and efficient platform for price discovery and risk management across a diverse range of precious metal, energy, base metal and agri products. “The exchange remains committed to the risk management requirements of the entire bullion fraternity. With their trust and support, our successful gold and silver futures contracts have displayed good volumes, turnover, open Interest (OI), liquidity and high hedging efficiency. For the Q1 FY 17, bullion contracts clocked an average daily turnover of Rs. 9,945 crore, with daily volumes of Gold at 21 metric tonnes (MT) and Silver at 929 MT for the period. The OI/Volume ratio reflected healthy hedgers’ participation. With the likely introduction of new derivative products, MCX will continue to strengthen its product offering to the bullion value-chain”, Mr. Mehta added. During the policy round-table at the event with the Hon’ble. Union Minister of State for Finance and Corporate Affairs, Shri. Arjun Ram Meghwal, the bullion industry brought all contemporary issues to the fore. There were elaborate discussions on the Commodity Transaction Tax (CTT) that has adversely affected the cost of hedging bullion price exposure in India, thereby pushing hedgers to overseas exchanges; and has also led to the rise in dabba trading. Participation of banks in domestic commodity exchanges was also touched upon. Having commenced operations on November 10, 2003, Multi Commodity Exchange of India Limited (MCX) is India’s first listed, national-level, electronic, commodity futures exchange with permanent recognition from the Government of India. In the financial year 2015–16, the market share of MCX was 84.30%. MCX offers the benefits of fair price discovery and price risk management to the Indian commodity market ecosystem. Various commodities across segments are traded on MCX. These include bullion, energy, metals and agri commodities. The exchange has forged strategic alliances with various Indian and International commodity exchanges and business associations.